Where are your decades-past pictures, photo snapshotos and 35mm slides from your Las Vegas adventures? Here’s a fun and informative story from Doug Elfman at the Las Vegas Review Journal that showcases why so many people are digitizing past travel adventure memories. In ye olden days, before we took photos on our phones for cloud storage, humans took photos like apes: We pointed an analog camera at something, captured an image on something archeologists call “film,” and then we paid “photo booth people” to develop “negatives” into photos. For 26 years, people have been sending such analog photos to a company called ScanMyPhotos.com, which scans customers’ old analog photos into computers and turns them into digital pictures. Recently, Katy Perry’s dad got old photos of her digitized, which she then put on social media. Some 70 percent of old analog photos submitted to ScanMyPhotos are travel pictures. And Las Vegas is the most prominent city in those photos, beating all Disney resorts, Paris, New York and national parks. Another media outlet claimed Disney beat Vegas, but ScanMyPhotos CEO Mitch Goldstone tells us Disney only beats Vegas is you combine all Disney resorts around the world, from Paris to Japan, so Vegas > Disney. Thanks to Conde Nast Traveler for profiling the recent ScanMyPhotos.com survey of the top travel destinations according to your photo album. Welcome to ScanMyPhotos.com, the photo digitization experts. Since 1990 we have safely digitized one-quarter billion photos and are now offering a super 78% discount for you to revisit, share and preserve your nostalgic photo snapshot memories. $49.95 to digitize up to 1,000 standard 4×6” photo snapshots to 300-dpi JPEG images on a standard DVD within 5–10 days. 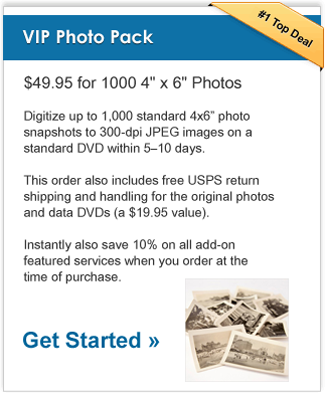 This order also includes free USPS return shipping and handling for the original photos and data DVDs (a $19.95 value). Instantly also save 10% on all add-on featured services when you order at the time of purchase. YOU MAIL PHOTOS IN YOUR BOX AND PAY FOR DELIVERY TO US VIA THE CARRIER OF YOUR CHOOSING, THIS DEAL ONLY INCLUDES SCANNING AND RETURN OF YOUR PHOTOS AND DVD DISC (OTHER SERVICES/PRODUCTS ARE AVAILABLE) AND FREE RETURN S/H ONLY. WE DO NOT MAIL YOU A BOX TO SEND US YOUR PHOTOS AND ALL SALES ARE FINAL. Purchase this deal online and print your invoice to include with your order. Your completed order form must be included in the box along with your photos and order form. Your original photos will be returned along with your DVD data disc. Additional Add-on products are available, including USB flash drives. Must view Photo Preparation Procedure before shipping your order. Style has come a long way over the years. If you’re curious to see just how far it has come, take a look at this Cosmopolitan article, What People Were Wearing the Year Your Were Born. From 1940’s vintage photos of big fur coats and tiny purses to the big hair and tight pants of the 1980’s, the styles that were captured over time provide us with glimpses into the real-life past of fashion trends. As such, it’s important to keep taking and preserving fashion pictures, whether you’re showing off cool outfits on Facebook or documenting the looks of our time. So, to help beginners get the fashion photography basics, we created this list of our favorite tips and tricks. Check it out. Rebecca said: It’s [ScanMyPhotos.com] easy, cheap, and amazing. I’m so happy I found them!